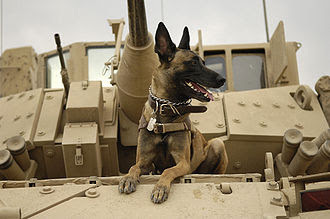 Now that is a war pooch! It seemed an appropriate milestone to stop and have a wee muse about blogging, and what it really seems to be to me. I started this blog almost a year ago, to document my Napoleonic British Army. Part of the idea was that I would actually write up how I did it, so I could remember the stages! But since then, the topics have been as varied as my attention span would allow, ranging in period, scale, theme, from battle reports to essays on Greek Heroes. Honestly, I find blogging strange. It is in a way a very personal thing, through a totally impersonal medium. I share my intellectual property with the internet, sharing ideas, concepts, plans and dreams. Is it good or bad? I don't know. It has certainly made me want to paint better- challenges such as the Analogue Painting Challenge have been great for my productivity! In addition it has brought me into contact with people all over the world, some leaving comments of encouragement or perhaps even passing the information on. I do like comments, to be honest it makes me feel important! If there are things you think I should look at, historical inaccuracies, miniature companies, new paint techniques, new armies, units or anything else; feel free to pipe up and comment. I like hearing peoples thoughts and ideas! To those who read and enjoy my posts regularly, thank you. Part of me always looks at the number of people who read what I write and thinks "its just one person, with internet issues refreshing the page lots of times to see a photo". I hope that what I write is as interesting to you as it was to me when I wrote it, and that you find something that might inspire you to want to look into something completely new, that you hadn't thought of before. I know that is how I feel after seeing things like Curt's (Analogue Hobbies) idea of making grey scale armies for WW1 gaming. So thematic, and (I think) will be so cool! In spite of all the self serving gratification, ego boosting and general peacock-like behaviour that blogging provides for me, I hope that what I produce/write/make/spill out has something of interest, although I suppose if it didn't, you wouldn't be reading this? Perhaps you are only in it for the pictures. If so, then google images has far less words than this, and is much easier to use to. More Romans painted tomorrow I think. Then a game of SAGA, the Irish are back to war! I often stop by here for a look and enjoy your posts, even if I dont always comment. Congrats on the 100. Many more read and don't post than post, mostly because of so many other blogs to read but yes it's great when you get a comment. I too hit 100 recently it's a nice thing to do. Congrats for hitting a century! I have to agree with you re the comments. Nice to know that others like the same stuff. Keep up the good work. Well done and keep blogging. I totally read and don't post cause it takes too long to log on and stuff. Keep up the good work.